Not long ago, we looked at some down-home local beeswax – straight from the beekeeper. 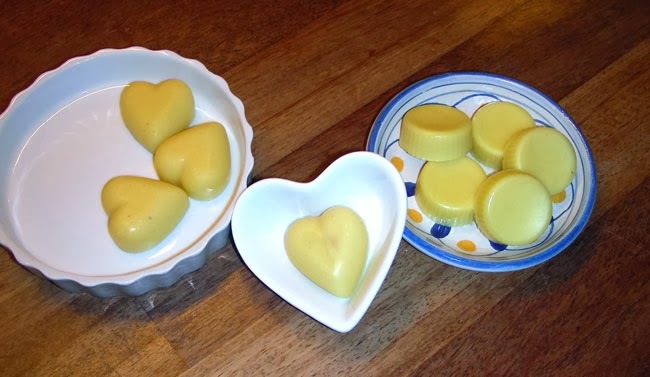 To test out both beeswaxes, I decided to try them out by doing a very small portion of lotion bars. 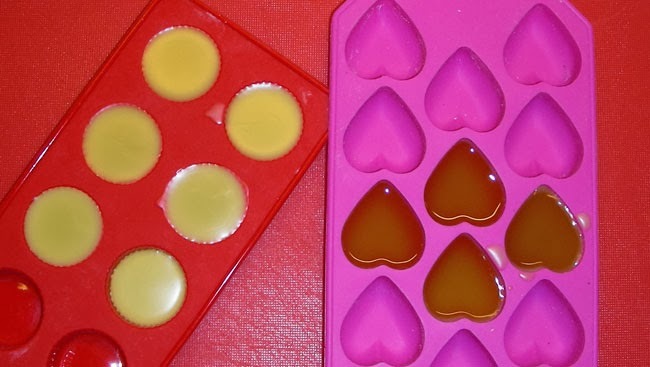 We've never done lotion bars on this blog! Prepare for some easy peasy, fun-loving lotion crafting, because lotion bars are actually so easy to do that you (almost) can't go wrong. They're also both fun to use and effective skin care for the whole family. If you want to add scent, replace 0,5% - 1% of oil with your preferred scent. Choose the butters you want, oils you want, and beeswax you want and create your very own personalized skin-smoothing beauty bar. It's all a question of your personal preferences. Depending on how soft a bar you want (or how hot a climate you live in), the above amounts can be adjusted and tweaked. Before we get started, I'm going to tell you what you want. You really really want to work exclusively in weight when preparing and making your lotion bars. 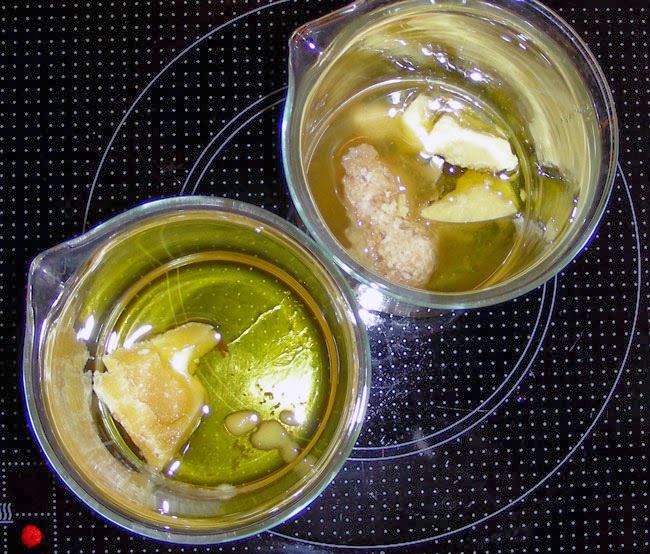 Mixing 'grams' of butter with 'milliliters' of oil isn't what you want. Trust me, it's simply not accurate enough. You are quite welcome to ignore this tip of course, but if you do, you will without a doubt create the most perfect, fabulous lotions bars on your very first try. You: "And what's wrong with that, Lise?" Me: "Because if you haven't measured by weight or taken accurate notes, you will then be doomed to spending the next 10 years trying to recreate your perfect formula". 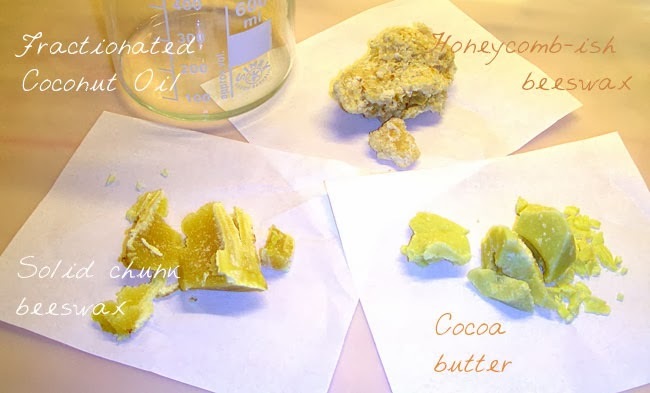 Here's how I made a very small portion of lotion bars with 2 different beeswaxes. To keep things as basic as possible (and so there was something to compare with), I chose to use only one butter and one oil for both versions. Place your beaker (or other heatproof glass container) on the scale and pour oil into it - easy peasy and accurate as all get-out. Step 1: Add all ingredients to a heatproof container and melt very slowly over low heat. Some prefer heating gently over a double boiler, and this is also a good method as the ingredients are not in direct contact with the heat source. If you decide to use 'my method', be sure to keep the heat very low and to babysit the mixture constantly. Step 2: Stir and pour into molds. As you can see in the pic above, the honeycomb-ish beeswax is much cloudier than the chunk beeswax. I was actually expecting quite the opposite, as I understood the chunk beeswax to be the unfiltered. (I must have gotten the info wrong). There was enough residue in both waxes to warrant filtering, so I poured the melted mixture through a double layer of cheesecloth. The result was very satisfactory. Above: the chunk beeswax (beaker on left) had hardy any residue while the honeycomb-ish beeswax (beaker on right) had quite a bit of residue. Here are the bars just after the second mixture was poured up. I wanted to photograph the cheesecloth straining part but it took both hands and needed to be done quickly. There are only a few minutes between the pouring of these 2 trays, yet the one on the left is almost already stiff enough to pop out. These bars were ready to use a mere 10 minutes after pouring the mixture into the molds. I'll let you know how they are to use in an upcoming post. Have you ever made or used lotion bars? What are your preferred oils and butters? Have fun Rikke! And do let me know how they turn out! Hi Lise! Raw comb beeswax, as a general rule, needs to be "rendered" to separate out the water-soluble content (honey etc.) and the propolis, which is what was left behind in your melting pot! Only then does one filter the wax. I've done it before, and it's a fairly hot, messy process, one that gives me even greater appreciation for the beeswax I buy from the beekeepers at my farmers' market! Hi Priya - Thanks for this! I will check out the tutorial. I have since also had a few questions answered by 'my' beeswax provider. Thanks so much Lisa, was attempting to formulate a 'bug off' bar, but all the other recipes I found online, used volume measurements which are REALLY annoying! Your 'basic' formula allowed me to mix up my oil blend (weighed of course), and subtract that from the third used in the recipe. Perfect! Hey there Anon - if you use a very fatty-feeling butter and fatty oil, you will get a greasier feel to the bar. Choose dry-feeling butters such as mango butter, and lighter oils such as fractionated coconut oil or hempseed oil for a less greasy-feeling bar. Best of luck with it.